Her exasperation with me and my low-brow humour was perfectly understandable, but I always felt that it was unfair to tar The Simpsons with the same brush. 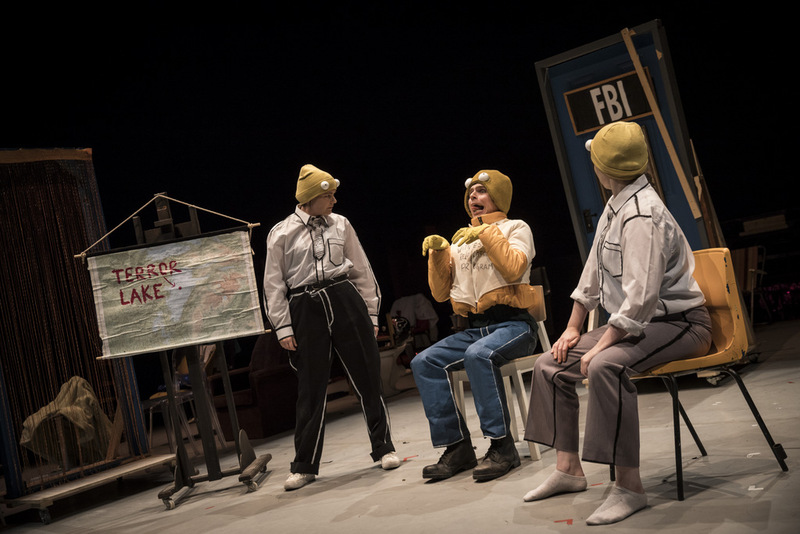 Now, thanks to Rough Magic’s production of Anne Washburn’s Mr. Burns – a play that proves a cartoon sitcom about yellow people with three fingers can be considered high art – I have been proven right. Which means she was wrong. So there. I have to be upfront and confess my bias. 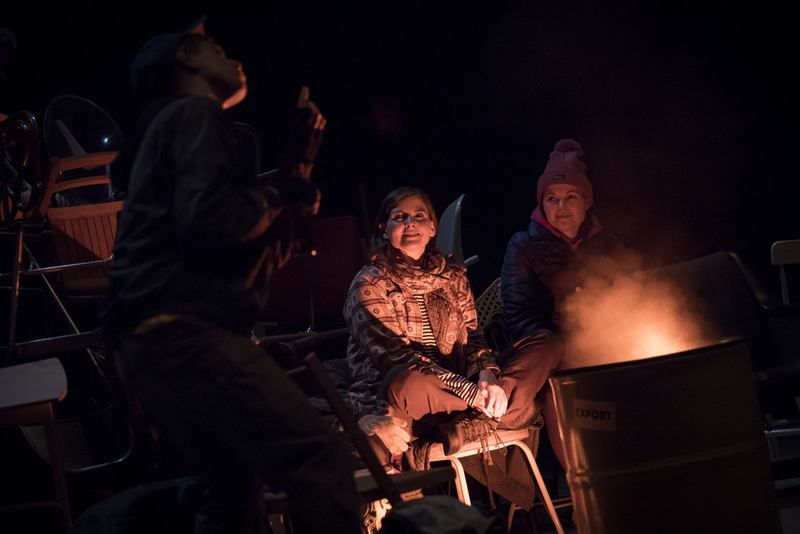 As a massive fan of The Simpsons – clearly not alone in the crowd last night – I thoroughly enjoyed a production that despite depicting an impoverished post-electric future, crackles with an electricity all its own. In the not too distant future a nuclear catastrophe has destroyed modern America. A group of survivors band together in an attempt to cling to normality, by retelling the few stories they can remember, principally the ‘Cape Feare’ episode of The Simpsons. Seven years later they are an embattled theatre troupe with a repertoire of varying quality comprised of Simpsons’ skits, commercials and musical numbers. Another 75 years later those stories have merged with fact to become the origin myth for a new society negotiating a path away from the cataclysmic events of a century before. Washburn’s script is both completely bonkers and wonderfully entertaining, and despite a few overwrought moments, successfully toes the line between its humorous subject matter and the apocalyptic outer world it creates. At its best, the play digs right to the core of the human impulse towards creative expression. Nessa Matthews’ charming but fragile Maria pleads with her fellow players, ‘Are we just entertaining them? We have an opportunity here to provide meaning.’ The struggle for validity and self-worth each artist faces every day. Instead of suggesting any answers, the play details the process in action. The group huddled round the campfire tell their story together, as the earliest humans once painted pictures of animals on cave walls. Through the three acts the re-enacted story develops from this hazily remembered campfire tale, to a polished pop-rap-operetta, and thence to the level of tragic Greek myth. Washburn reminds us that in order to both create a society and to understand that creation we must constantly tell and re-tell our stories through whatever means are at our disposal. Aligned to that, and on a darker note, is the question of how much we as a society are devouring our history and myths for economic gain. Recent productions in Ireland have exploited the Easter Rising and The Famine for entertainment purposes. The entire second act here is mired in black-market horse-trading between rival theatrical troupes over rights to specific Simpsons’ lines and references. Meanwhile people starve, and the effects of nuclear fallout are never allowed to stray far from the characters’ mind. Ultimately the show’s bloated final act drifts between Greek tragedy and musical theatre, awkwardly straddling the worlds of communal culture and commercial success. Conversely as society re-emerges, its shared tale becomes more refined, less inclusive, accumulating all the necessary ingredients for an origin myth – acquiring symbols and costume, national heroes and most importantly of all, a common enemy. It is here that the play pins its colours to the mast, identifying capitalism and greed as the causes of the world’s decay, personified by Ross Gaynor’s Frank Underwood-inspired Mr. Burns. 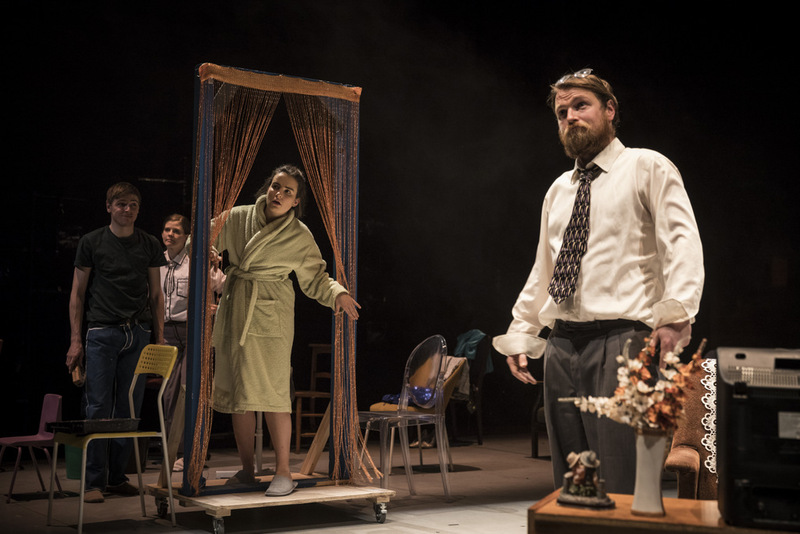 The show is a mammoth undertaking and director Ronan Phelan has brought the best out of an immensely talented young ensemble from which singling out individual performers seems both futile and unjust. Molly O’Cathain’s chair-cluttered set and costumes have an appropriately cheesy Americana feel whilst Claudia Kinahan’s choreography manages to strike the right balance between rough and ready and sharply polished. And for a play littered with classic pop tunes Sinead Diskin’s music direction is superb. For all that, some niggles remain. Phelan’s pacing is at times too heavy-handed, leading to some of the early dialogue coming across as stilted. The play is also too long, in particular the final act, which makes its point in the first 10 minutes and then proceeds to triple that. And ultimately the somewhat generic, overproduced finale slides into a very American musical theatre sentimentality that just misses the mark. Performed by: Peter Corboy, Ross Gaynor,Ciara Ivie, Nessa Matthews, Karen McCartney, Conor O’Riordan, Cate Russell and Sophie Jo Wasson. Performed by: John Cronin, Fionn Foley and Janet Moran.